This is a short story, reprinted with permission from The King of Lighting Fixtures, by Daniel Olivas, 2017, University of Arizona Press. Rogelio had never seen the wall except online and on TV. He thought it was ugly even though the president had it decorated with an ornate gold paint that swirled in strange designs along the wall’s top and bottom edges. Between the borders of gold paint were bas-relief scenes from the president’s life beginning from his childhood, through school, beginning careers in business and television, running for president, the swearing in, and the president signing executive orders. 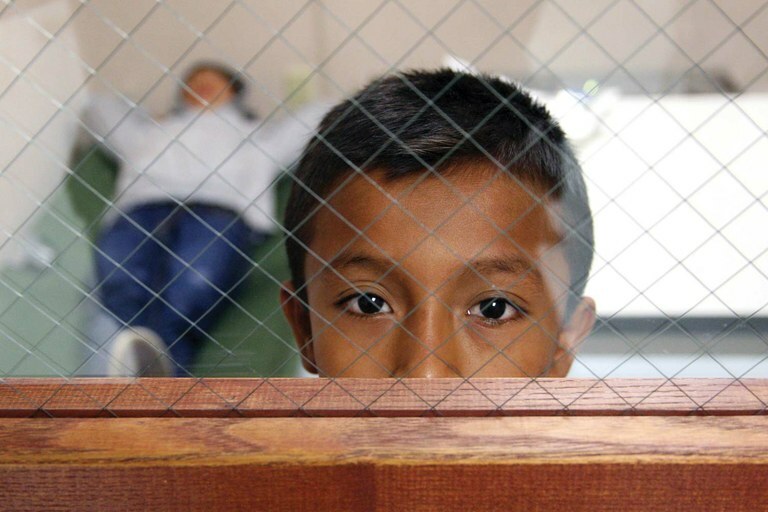 A Mexican boy looks out from a detention center room in Brownsville, Texas. The children who had already visited the lookout points — which were simply large rooms with the far wall made of bulletproof Plexiglas — said that it would have been easier to set up computer screens to say goodbye to their parents. But instead, the president’s executive order explicitly prohibited the expenditure of funds for such “niceties,” and, instead, ordered that the families’ farewell would be soundless, without the aid of microphones, with children on one side of the Plexiglas, the parents on the other. Once in the lookout points — one for boys, the other for girls, as decreed by the president — the children would wave to their parents, who would be allowed to wave back. After a “humane” period of 30 seconds, the children would be directed out of the lookout point and back to their barracks to pack up their meager belongings for a new life with a relative or adopted family. Since these children had been born in the country, they were citizens. But their parents had entered the United States without documents, most with the assistance of well-paid coyotes. So, after the silent goodbyes, the parents would be ushered into a large black bus that would whisk them off to one of the reinforced gates in the great wall and back to Mexico, even if they had come from a different Latin American country. Neat, clean, fast and beautiful. As Rogelio inched closer to the boys’ lookout point, his heart began to beat hard in his small chest. He willed himself not to cry, to be strong, to show his parents that he and his sister would be OK living with this aunt in Los Angeles who had become a United States citizen under President Reagan’s 1986 Immigration Reform and Control Act. The guard’s loud “Next!” broke Rogelio’s reverie. He walked into the lookout point and stepped up to the thick, cloudy Plexiglas. Rogelio squinted. About thirty yards of open terrain separated the two detention centers and their respective lookout points. Where were his parents? Oh, there! He could discern his father, who was a hearty, large man, but who now looked so small. His father wiped his eyes with a crumpled white handkerchief and embraced Rogelio’s mother with his right arm. Rogelio’s sister must have already seen their parents since she had been just a bit farther ahead in the girls’ line. He wondered if Marisol had cried. But Rogelio promised himself that he would not. He waved to his parents as he forced a smile that looked more like a pained grimace. His parents waved back, also forcing smiles, but Rogelio could see that their faces were shiny with tears. Before a guard directed his parents toward the exit, Rogelio let out a sob, his chest shaking without control. He told himself: Don’t cry, don’t cry. But now Rogelio’s tears fell freely from his eyes as a guard put a hand on the boy’s shoulder and gently guided him away.